Aluminum Pergola Kits. Get information of our innovative product. Inspired by European design. Constructed for Canadian living. Envision your outdoor living space easily adapting to the ever changing climate of Canadian seasons. Have the flexibility of creating a more comfortable, relaxing, functional space with the turn of a louvre. 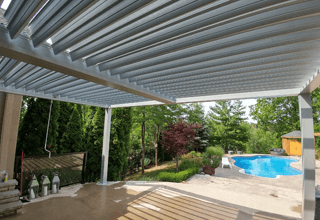 Our aluminum louvered pergola will add value to your home or business, along with providing you with a unique freestanding or attached structure that will give you a multi-purpose space to host your friends and family or clients in a variety of weather conditions. We also offer unique add-ons to take your outdoor living space to another level. Add side panels for privacy and added warmth. All of the structural elements of our pergolas are made from 6061 Alloy T6 aluminum. This creates a solid structure that can withstand wind speeds of 120mph, heavy rain, snow loads of 65 pounds per square foot, and harmful UV rays. Our European inspired aluminum louvered pergolas offer a multi-functional, aesthetically pleasing structure that comes with a 10 year warranty on all the structural components of the pergola. Other than cleaning off what the elements leave behind your aluminum louvered pergola is maintenance free! Your aluminum louvered pergola can be built anywhere you require a multi-purpose space that needs to work synergistically with the ever-changing environment. Control the ambient temperature around your guests with a simple turn of a handle or push of a button. Enjoy your outdoor living space in any weather. Our louver system allows you to let in light when the sun is shining and shelters you when it rains. Adds value to your home or business! Made of aluminum, manufactured in Canada, and no maintenance necessary. Provides a platform for lighting & ceiling fans. Our system also allows you to add outdoor audio visual solutions with ease. Control the ambiance of your outdoor space to help maximize a positive customer experience. Increases outdoor usage & table count. Maximize your outdoor space and add revenue. Facilitates outdoor productivity & protection from the elements. Invisibly integrated ZIP screens in the frame. The ZIP screen is a vertical, windproof and insect repellent screen. A unique slithering system keeps the fabric in a perfect position at all times in the vertical poles of the Pergola. A ZIP Screen resists wind speeds up to 49km/h. The Outdoor Living can be equipped, optionally, with powerful, white LED lighting. These LED strips can be mounted in the louvers as well as in the frame, and are operated with the same transmitter as used for the roof and the screens. Beside the white LED lighting, we also have the RGB LED lighting, which is possible in the frame. Intensity and color can be chosen when using this type of lighting. Our unique system can also integrate many add-ons depending on the needs of our clients. Working closely with local partners we are continuing to grow our offerings. Create a comfortable space away from bugs with the addition of screen system that seamlessly is attached to our pergola structure. Our system can also accommodate LED lighting for ambiance and functionality. Add outdoor speakers and monitors and protect all the components from the elements. 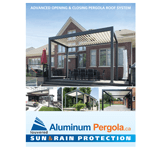 Our team at aluminumpergola.ca is continuing to improve what we offer to our clients across the GTA. We continue to receive a lot of interest on aluminum pergola kits. We are currently not offering aluminum louvered pergola kits at this moment, but as demand continues to grow we are working on a “DIY” solution. Continue checking in with our team at aluminumpergola.ca for more information.